“Her brother is extremely conservative,” Ms. Amanat said. “Her mom is paranoid that she’s going to touch a boy and get pregnant. Her father wants her to concentrate on her studies and become a doctor.” Next to those challenges, fighting supervillains may be a respite. That sounded entirely familiar to me. Coming from an Indian family myself, this is the type of beliefs and views I grew up with as a 1st generation Indian-American. Parents that don’t quite understand, that have expectations that follow cultural norms instead of what their child wants…that was all normal for me. I don’t know how many times I was told how good it would be if I became a doctor! And then, I broke a rule of the internet. I started reading the comments on articles like this. There was your typical mix of praise and bashing that went back and forth. That’s easy enough to ignore. But there were a specific class of comment that kept catching my eye. They were always variations on one idea: A super conservative brother, a mother terrified by boys, and a father that wants her to be a doctor. How stereotypical. Those comments bothered me. And they bother me more now that the first issue came out. Yes, that sort of family sounds stereotypical. The issue itself doesn’t detract from that opinion – we didn’t see a lot of them yet, so that may change, but they were pretty much what I was expecting after reading the initial description. But there was something else that I saw while I was reading. I saw my own family. A lot of the same beliefs, a lot of the same comments, even some of the same habits. It all felt so familiar to me and only made me love the issue that much more. And it hurts that people will see something that I find so relatable as something bad or wrong with the story. That got me thinking – what is so wrong with “stereotypical”? In the comments made about Ms. Marvel when it was first announced, it was always used as if it was a bad thing. But is that really so bad? Stereotypes may be something that writers and creators are told to avoid, but that’s usually because they have been done to a great extent before. So maybe we don’t want to see another All American Boy. I would think titles that Captain America have done enough of that already. You could even look at Peter Parker as the stereotypical geek and outsider initially (that’s obviously changed a lot since then…). You don’t think any less of either character because they started from stereotypical roots. Its certainly never seen as a detriment to the series. And, in my opinion, it’s because these were some of the first of their kind – the first portrayals of points of view that weren’t seen as often at the time. 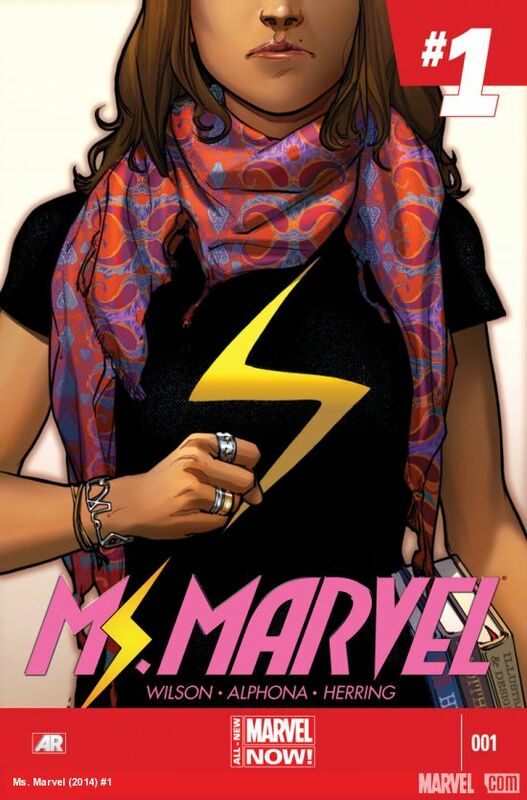 Kamala Khan, to me, is one of the first of her kind. It’s not common that we see any girl of Indian/Pakistani/Bangladeshi decent that probably identifies more as American than their country of origin, and the struggles that come with being a 1st Generation American from a traditional family. It’s not a point of view that we get to see in media. I imagine its analogous to a time before Peter Parker existed, and seeing a geeky, somewhat awkward boy portrayed in media was uncommon. And then Peter Parker comes along and people flock to him – because they can see themselves in him. It was surely stereotypical. It would not have applied to every person who as more of a geek and misunderstood in school. But it was the first time anyone had tried to come close. Kamala Khan is the same as Peter Parker to me, just to a different subset of people. To those of us that are 1st generation with parents from very different cultures, this stuff is relatable in a way that most media isn’t. And it’s the stereotypes that make it relatable – because those stereotypes is real life to us. I have been told that I needed to become a doctor. I have been warned away from boys. I have been told that I’m not “Indian” enough, and not “American” enough. I have had to live between two worlds and belong to neither. Having one little spot in my entertainment that makes me feel like I’m not entirely alone is a good feeling, stereotypes and all. Well Hello There Everyone! I don’t know if anyone is going to read this…seeing as it’s been a good 9 months since I last posted, but I figured I’d give it a shot! Life bogged be down rather badly in the second half of last year and I’m only just digging myself out it. To put that into comic book perspective, I’ve got over 100 in my pile to read and am just starting to try and work my way through it. But that’s not why I’m here! I realized the other day that I was nearing the one year anniversary of me getting into comics, and this blog had been a huge part of what got me into them and what kept me into them! I missed reading people’s comments and their own blog posts and getting ideas and opinions outside of my own. So I’m back…a little older, a little better versed in comic books as a whole, but still learning as I go. I don’t think I’ll be following the same format as before…mostly because of the giant backlog of comics I still have to read!! But I do want to post something on here fairly regularly on whatever topic comes to mind. I’ve got at least one that I want to do in a day or so…and from there we will see. Hopefully it’ll be interesting enough for everyone!